AUTHENTIC PodSkinz AirPods Case only sold by Seller Name "MSSV". Avoid Counterfeits and Low Quality Knock Offs from Sellers like "Vanessa Elli" and "exchangedgoods"
IMPACT RESISTANT ELASTOMERS - Engineered from durable and impact absorbent elastomers to provide the perfect balance of protection and fit. ULTRA LIGHTWEIGHT - Just half an ounce yet helps protect your AirPods against bumps, drops and shock without adding bulk to your charging case. 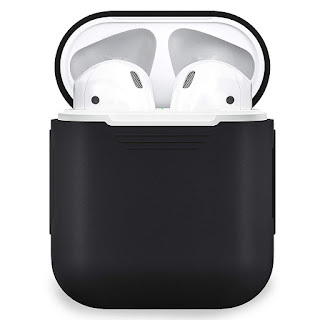 SCUFF PROTECTION - Long lasting protection against scratches keeps your AirPods Charging Case scuff-free and clean. Hassle-Free one step installation. 30-Day 100% Money Back Guarantee & 1-Year PodSkinz Case Warranty - AirPods & AirPods Charging Case NOT included. If you’re unhappy, our team of highly skilled service ninjas will jump through hoops to put a smile back on your face. Send us a message us through your Order Invoice and we’ll get back to you faster than you can say supercalifragilisticexpialidocious. Included in the Box – One (1) PodSkinz Silicone Case. Apple AirPods NOT included.